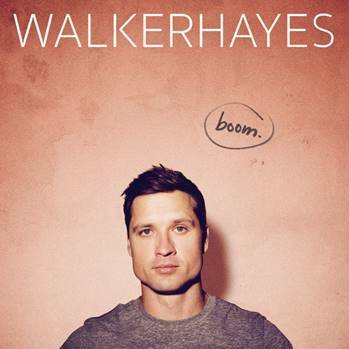 Alabama native (but long time Nashville resident) Walker Hayes releases boom., his long-awaited, full-length studio album, on Friday 8th December, via Monument/Sony Music. Hayes, who wrote or co-wrote every song on the 10-track album, many with ambiguous song titles, chose an album title that may well be his only instance where the title might give away the meaning. “’boom!’ It’s my favourite word. It’s the first thing I say after I play a song from the album for anyone. So, it’s what we had to call the album. I’m just so excited to share another part of the story. BOOM!” boom. is available to pre-order now on Amazon and iTunes. boom. is produced by Grammy-Award winning producer Shane McAnally. “You Broke Up With Me,” the project’s debut single, has already accrued over 25 million streams. At US mainstream country radio, it’s just hit the Top 30 and is climbing. Listen to “You Broke Up With Me” here. In anticipation of his new album, Hayes has also released “Beautiful,” (listen here) and “Halloween”, a duet with esteemed songwriter Nicolle Gaylon (listen here). Before the album is released, Hayes will release one more track, directly to the fans who can’t get enough of what People calls his “irresistibly quirky” songwriting. One of Rolling Stone’s 2017 “Country Artists to Watch,” Hayes gained attention last year with 8Tracks Vol. 1 and Vol. 2. Sixteen self-written and recorded song catapulted the singer/songwriter from working night shifts at Costco to the top of the music charts — and onto tours with Dan + Shay and Bobby Bones’ Funny and Alone Comedy Tour. That momentum has earned him a highly coveted opening spot on Thomas Rhett’s Home Team Tour.